Plentybenjis.com claims to be a site where you can earn a check in between checks. But is Plenty Benjis a scam or is it really a legit and great way to earn online? I have joined to test the site myself and compared the opportunities it has to the hundreds of other survey and get-paid-to sites I have tested. In this Plenty Benjis review, I will show you all the details so you can find out if it will be worth your time or not. What is Plenty Benjis and what does the site offer? Plenty Benjis is a GPT (get-paid-to) site with several ways to earn. I could not find much information about the company and who is behind it. But it lists a phone number on the website which is a good sign. However, right when I came to the site I saw an ad that worried me a bit. This ad worried me because of where it took me. 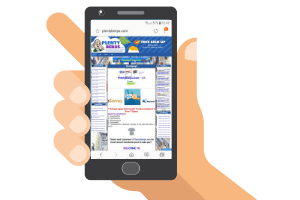 This ad took me to a site called Take Surveys for Cash, which is a site I have reviewed in the past and strongly advise against as it is a site that charges you only to give you access to a list of survey sites. This made me a bit suspicious because if they allow ads like this, it is not really a site focused on quality, in my opinion. On the other hand, I am also aware that a website cannot always control which ads show up on its site so maybe it is not a deliberate choice by them. Anyway, I gave them the benefit of the doubt and joined to see what you get on the inside. But just be aware that you should not trust all the ads on the site – some of them are for very poor products, in my opinion. But let’s then look at the options you get access to after joining Plenty Benjis. One of the great ways you can usually earn and get to share your opinion at the same time on most GPT sites are by taking paid surveys. You can also find this option on Plenty Benjis. However, when I clicked the daily surveys option it was not really paid surveys I got access to. The daily survey option does not really offer surveys. Instead, it was a list of banner ads for places you can sign up to take surveys. 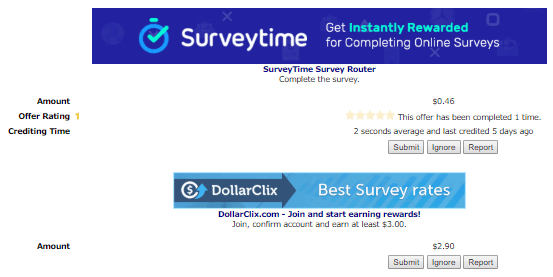 On the image above, you can, for example, see an ad for the survey site called Surveytime. It is definitely a legit site and one of the sites I think is great to join. But it does not really belong in a section called daily surveys. Instead, it is a section where they post banner ads to other sites they get paid to refer you to. And then they pay you a small reward to sign up for these. Nothing wrong with that but it is not really paid surveys and should not be in a section called this. That gives a very poor user-experience and makes it difficult to find out exactly what you get on Plenty Benjis. However, there are other sections on the site where you can find survey walls that give you access to survey routers. There are just not a lot of surveys available and the ones that are there mostly give lower rewards than you would get for the same surveys on other similar sites. So overall I am not impressed with the paid survey options on Plenty Benjis. But let’s then look into what other earning methods it offers, so you can see if some of those might be worth it. Paid offers can be a good way to boost your earnings on GPT sites as long as you make sure to read the conditions and find the right offers. Plenty Benjis gives you access to quite a lot of offer walls. You can find two sections in the top menu with many walls in each. You can find many offer walls on Plenty Benjis. It is, of course, good to have access to many. But a problem with Plenty Benjis, in general, is that it is not very user-friendly and it is difficult to find the best offers. It would, in my opinion, have been better if they had focused more on quality and less on quantity. There definitely are some offers there where you can earn some extra cash. 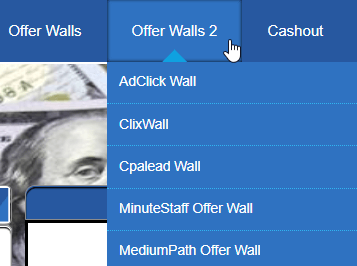 But many of the exact same offer walls are, for example, available on a site like ClixSense that overall gives better opportunities, in my opinion. And there are also many offer walls on Plenty Benjis that does not really have good offers. So you can spend a lot of time filtering through all the offers to find the ones that are worth it. On any GPT site, there will be both good and poor offers on the offer walls. But because of the big amount of offers and a design that in general makes it difficult to navigate, it can extra take time to find good offers on Plenty Benjis, in my opinion. In the “earn” sections in the top menu of Plenty Benjis, you can find a PTC option. 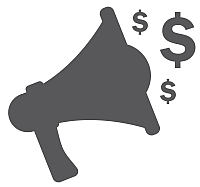 If you do not know what that is, it stands for paid-to-click, and it is a way for you to earn by clicking small ads. However, in that section, I only found one ad. I only found one ad in the PTC section. This is a really poor selection compared to other sites that offer PTC options. However, personally, I rarely use the PTC option anyway as it gives extremely low rewards. For the ad you can see on the image above, you would get 1 point which is the equivalent of $0.01 – this is actually a very high reward for a PTC ad. But there was only one of these ads. However, you can find more ad walls in the offer wall sections. The rewards for those ads are, however, extremely small and you would have to click thousands of them to just earn a couple of dollars. So you can earn by clicking ads on Plenty Benjis but not a lot and it will take a lot of patience. You can earn a bonus by inviting friends to join Plenty Benjis. If you invite someone to join and they will start earning, Plenty Benjis will pay you 10% of your friend’s earnings. You friend will earn the same, and the 10% will be paid by the platform to thank you for inviting others. Before using this option you just have to consider if you really like Plenty Benjis yourself and if it is a site you think some of your friends will like. If yes, then go ahead and invite. But if you do not really think it is good and just start inviting others to try to earn, you should not expect good results. If you do not like it, your friends might also not like it. And if they do not use it to earn it will not earn you anything, and they might even get annoyed you invited them if it is not a good platform. So just make sure it really is a platform you can recommend before starting to invite others. If you are actively using Plenty Benjis, you will automatically participate in two monthly bonus contests. These are contests with a prize for the top 10 earners every month and for the 10 people that completed the most offers. Below you can see an example of one of the top 10 lists and the rewards people got. You can win a prize by taking the most offers or earning the most in a month. I like they give extra rewards like this to its most active members. But you should not use the platform for the chance of these rewards alone. You have to take a lot of offers to get into the top 10 and a first place would give you $10. If you had taken the same amount of offers on other GPT sites, you would probably have earned more, so even though it is great with a contest like this, it should not be a decider for you. There is a way to upgrade your Plenty Benjis account that I find a bit strange. There are several similar sites that offer different membership levels but usually, you move to the next level and get more benefits by being active on the platform. On Plenty Benjis you can buy an upgrade for your membership. There are two levels you can choose from. You have to pay to upgrade your membership. Level 1 is where you will get 10 x the chance to have your account be the referral of the members that join without a referrer and you will get an extra 5% more from referrals. For level 2 you will get 20 x the chance and 10% more from referrals. In general, I do not really like when GPT sites ask you to pay for a higher membership to get more advantages. Especially not when it is this vague about what it actually gives you for the money. It says you will get a higher chance of getting referrals designated. But I could not find anything on the site about how this supposedly works. So what does 10 or 20 x more means if you do not really know how the system even works from the beginning? So if they do not explain anywhere how big the chances are with a regular membership, this does not make sense. If the regular chance is 0, then 20 x more will still be 0. So very strange they do not explain it better. But if you, in general, are planning to invite a lot of people, it might be worth paying to get the extra percentages. I still do not like they charge for it as I have not seen any other GPT site do this. Now you know how you can earn on Plenty Benjis but another very important thing is, of course, to know how you will get paid. You will either earn cash or points for your activity on Plenty Benjis. You can convert points to cash and the other way around. The rewards available depends on whether you want to use your cash or points. However, the reward section was empty for the points option when I checked. But you can get your cash out in several ways. Some of the payout methods on Plenty Benjis. The above image shows a selection of some of the payout methods you can use. 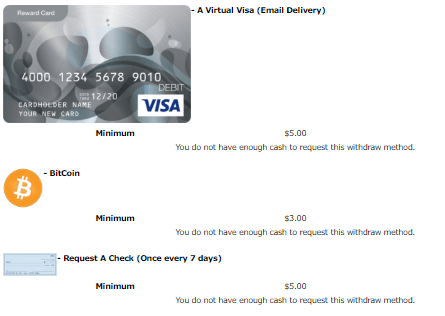 The methods are virtual Visa, Bitcoin, check, Skrill, or Tango Card. If you just want your money is cash, I would suggest you to go for Skrill as that is the easiest way to get them then. But if you prefer PayPal as a payout method, then you need to find sites that offer PayPal as this is not an option on Plenty Benjis. The payout threshold on Plenty Benjis is a bit unclear like many other things on the platform. In the FAQ section, it says you can get paid when you have earned $5. But when you look at the reward section, some of the rewards show you can cash out already when you have earned $1. So I am not completely sure what the payout threshold is. But even if it is $5, it is not too high a threshold. Overall, Plenty Benjis has quite a lot of earning methods. I do, however, think the site is quite confusing to use and the rewards and conditions are not as good as on many other sites. It is definitely possible to earn a bit of extra cash on it, but it will not make you rich. The site is also not claiming that. In fact, the slogan of the website is “earn a check in between checks”. I like they are so honest about the earning potential. So this clearly shows it is a site that makes it possible to earn a bit extra on the side but you should not expect more. It is great being able to use GPT and survey sites on mobile as you can then earn on the go and whenever you just have a few extra minutes. This is very difficult to do on Plenty Benjis. It does not have an app and the website is not at all optimized for mobile. It is confusing to use it even on bigger screens and on mobile it just becomes even worse. 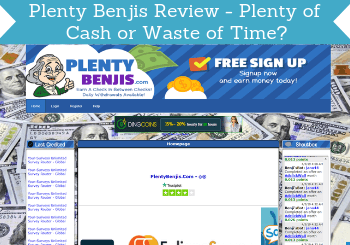 So if you like to use GPT and survey sites to earn on the go, then Plenty Benjis is definitely NOT a good option. Who can join Plenty Benjis? A good thing about Plenty Benjis is that you can join from all countries. The number of opportunities will, however, vary from country to country. I have tested MANY similar sites and I must say that, in my opinion, no matter where you live, you will find sites with better opportunities in your country. So even though you can join Plenty Benjis from any country, it does not mean it necessarily is a good idea. If you should need support, you can submit a support ticket on Plenty Benjis. You can also find a phone number by going to the contact page. It is quite unusual for a GPT site to have a phone number listed but nice the option is there. However, if you have general inquiries or questions, I would suggest you to just use the contact form. But it seems like you can get support if you should need it. From testing Plenty Benjis and taking a closer look, it looks like a legit site where you can earn a bit of extra cash. This does, however, not mean it will necessarily be a good option. So to help you get a better overview before deciding to join or not, let’s finish this review by summing up the pros and cons. Overall, you can use Plenty Benjis to earn a bit extra but it is definitely not one of the best options. The usability is very poor, there is a lot on information that is unclear on the site, some of the ads they show are for really poor programs, and the overall earning opportunities are just not as high as on many other sites. I instead suggest you to check out the best GPT and survey sites in your country. These sites are easier to use, have better opportunities, and better payout conditions and are therefore a better use of time, in my opinion. If you have any comments, questions, or have any experiences with Plenty Benjis yourself, I would love to hear from you in a comment below. Plenty Benjis is a way to earn a bit of extra cash. But compared to many other similar sites it is NOT a good option, in my opinion. It is not very user-friendly, some of the options are quite confusing, the payout conditions/options are not the best, and you can earn more for the same offers and surveys on other sites. Therefore, it is NOT a site I recommend even though it seems legit.